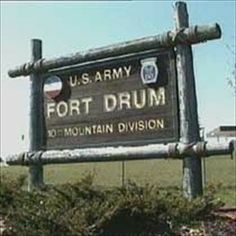 Fort Drum, home of the 10th Mountain Division is a large part of life here in the North Country. It is located next to Calcium, Black River, and Evans Mills, and is split between the Carthage Central and Indian River Central School Districts. All of these surrounding villages are great places to find beautiful homes. Fort Drum has brought so many consumers from all over the world, the shopping and eating offered around has greatly varied to fit everyone’s needs. Fort Drum is also in close proximity to the city of Watertown where there are many other great living opportunities for incoming residents. So many events take place both in and outside of Fort Drum, there is never a shortage of activities. There are many different types of homes in the surrounding areas, and our agents can help you find one that fits your needs. Bridgeview Real Estate supports our troops and wants to help them find their own homes in the North Country!